And no, it won't get you drunk. "I wanted to try it and I wanted to be over the top" Andris Lagsdin, founder of the Kickstarted Baking Steel explained to The Huffington Post about his $50 pizza doughs. Apparently Lagsdin was just having a casual conversation in his kitchen with a friend, The Seattle Food Geek writer Scott Heimindinger, when inspiration bubbled up. The Champagne pizza had risen. 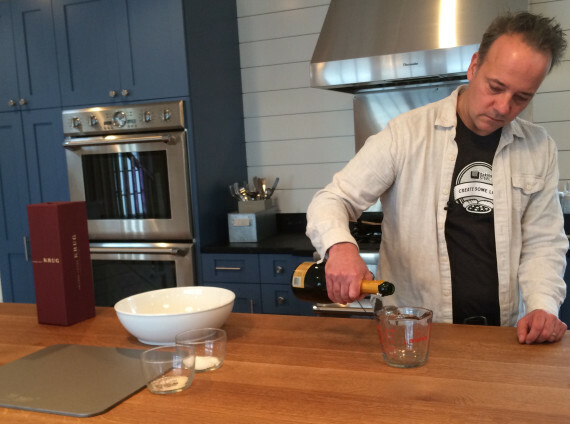 Instead of settling for a cheaper Champagne for the first attempt, Lagsdin reached out to Gary Vaynerchuk of The Wine Library, who suggested using a $150 bottle of Krug to meet the previously mentioned desire to go big with this pizza. 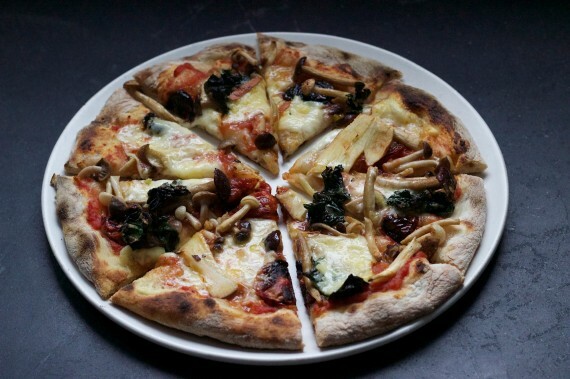 Another friend, chef Paul Booras, helped choose the toppings for three different Champagne pizzas: garlic sausage and kale, beech and chestnut mushroom, and artichoke and Gorgonzola. 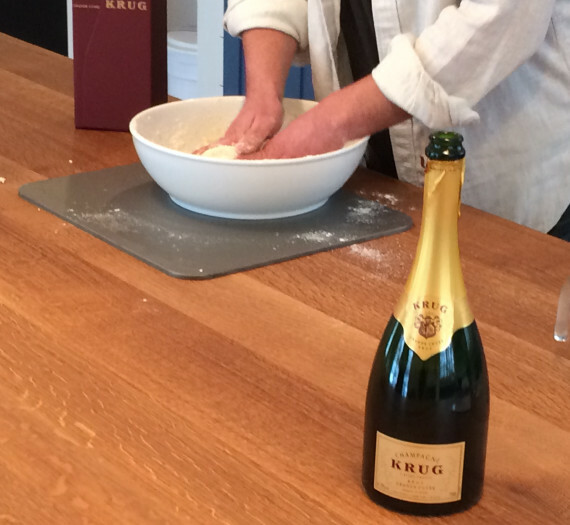 So you used a $150 bottle of Krug for this recipe, but could a cheaper bottle also work? Yes. What I did is I practiced last week with a bottle of Prosecco. A $10 bottle or a $12 bottle -- how would it react to the dough, if you will. I had to compensate a little for the bubbles, the carbonation. In other words, I usually use 350 grams of water in my no-knead dough. I may have used 400 to compensate for the alcohol and the bubbles. One of the more obvious questions, but could you get tipsy from eating the pizza or is the alcohol cooked out? It's definitely cooked out. Although it's funny, I got up very early to do my dough balls and I swore I had a bit of a tipsy sensation from the smell. Everyone was pretty happy that day, so maybe there is something to it. 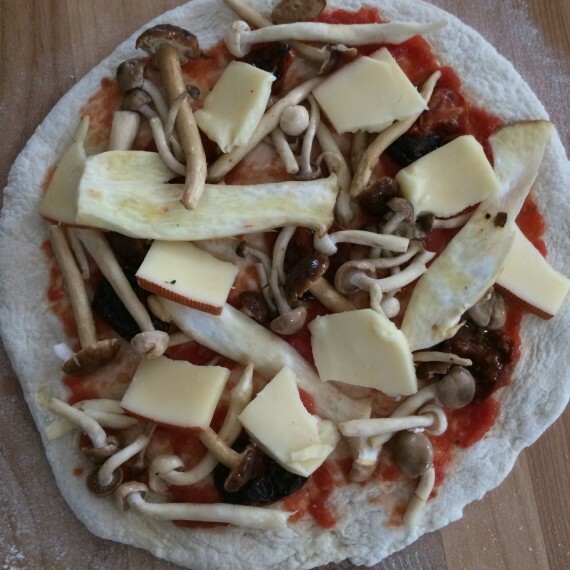 There have been combination pizzas where people have added things like marijuana to the recipe or other things. Would you consider trying something similar? Totally, I'll try anything! What kind of got the creative juices flowing after Halloween, is I used a pumpkin beer in the dough. I was amazed at the flavor profile of that dough, which got me thinking for this holiday season what else we could do. Such as Champagne. I might do some gingerbread dough for Christmas as well. It's wide open. We know we can make pizza dough with water, but what else can you put in there to add some flavor? Finally -- I just want to know, so it tasted pretty good? What did the Champagne pizzas taste like? It tasted like Champagne in the pizza dough! It was amazing. The scent of it when it's in the dough form is very very powerful, so then when you cook it you can clearly taste the difference between this dough and a cup-of-water dough, if you will. The hint of the carbonation a little bit, you can taste it. Clearly. The sugars that are in the Champagne, it was awesome. I'll be doing it again, but maybe not with the Krug (laughs).